What Is a Culminating Project? The culminating project can also be called the graduate project or senior project and is usually conducted during the final semester of high school. Passing your project is a graduation requirement and if you do not submit your project on time or do not meet their quality requirements then you will not get your high school diploma. Knowing what is a culminating paper project can be a little confusing, however. Each education authority and even each school within each area may have a slightly different culminating project definition and may use slightly different processes and forms. The basic capstone project ideas for information technology ideas, however, are the same. You will be required to write a research paper, create a product of some description and also present and defend your paper in front of a small audience. For many, this may be a task that they really are not looking forward to. However, if you approach it methodically you will be able to ensure that you pass your culminating project and graduate. Your culminating project ideas are often the hardest thing to come up with. Deciding what you will actually research will have a huge impact on how your project will go. You need to select something that you have an interest in, however, you should not select something that you already have expert knowledge in as it would not be challenging enough for you. It must be something that not only you will be able to research but also something that you can create something from as you will have to have a physical “product” to demonstrate your research also. Your topic must be broad enough for you to be able to find sufficient research on the area but not so broad that it does not allow you to focus your research on a specific area. One way to select the right culminating project topics for your research is to look at what others suggest. Even if what you see is not exactly what you are looking for the ideas may trigger your own thought process into coming up with something more suitable for you. Often your school or educational authority will have a specific form that will need to be completed as your proposal. This will need to be completed and approved prior to you being allowed to conduct your project. A description of your project: along with your reasons for choosing it and the level of challenge it will provide for you. The purpose of your project: what problems will your project solve and who is your intended audience. Action plan: you need to detail the main steps that you will take when conducting your project and research and provide timescales for each. Obstacles: you need to identify any obstacles that you can foresee that may hinder your ability to conduct your project and provide solutions for each. Benefits: who will benefit from your project and how. 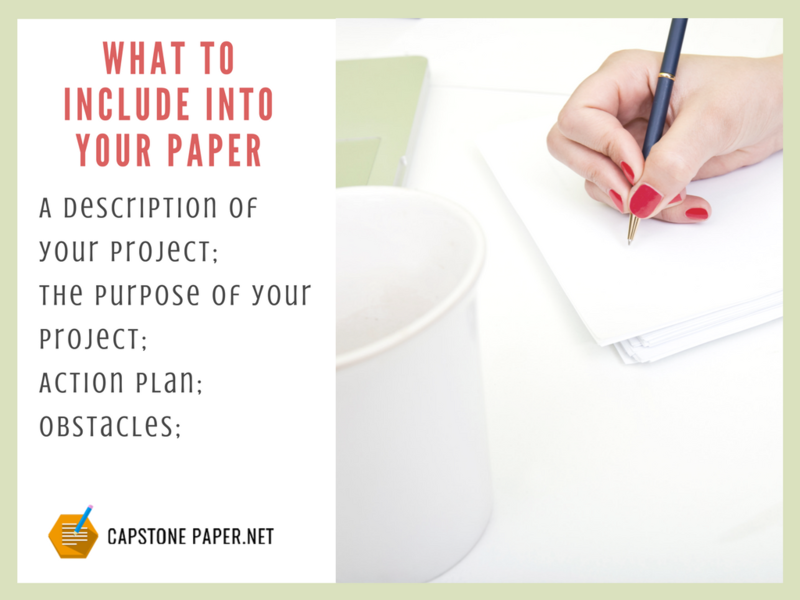 Your culminating project is a form of the research paper and will generally be expected to be from 8 to 10 pages in length although this can vary from school to school so you will need to check their specific expectations. You also need to check what format you will need to write your paper in; generally, you will be expected to use APA or MLA styles of writing for your paper. The actual structure is often left to you however and will depend very much on the type of project that you intend to follow. You will have to create a timeline for your project as part of your proposal, do not fall into the trap of leaving everything to the last minute because you have a few weeks to get the work done. Always try to follow your timeline as best you can. Create a clear outline for writing your paper. This will help you to better understand what you will have to write and what will be covered in your writing. Your thesis or research question is one of the main parts of your paper and must be clearly articulated and defined. This is what will guide your research and it should provide you with a clear reason for your paper also. Papers generally should contain a minimum of 5 sources of information that should be cited within your paper. Sources of information should be reliable and if there are any hints of bias then you should be able to identify it. Do not only use the internet; use the library to gain information from other publications and journals. Do not, however, use general encyclopedias as sources for your information. All citations used within your paper must be listed in your bibliography or references page in the correct academic format. You will be expected to include an original graphic of some form. This can be a sketch or a graph but it must be created by you and not simply copied. Proofreading is very important, mistakes in your English will have a serious impact on your ability to pass. Do not simply rely on your spell checking on the computer; review your work very carefully and if possible ask others to read through also. Many students will struggle with the requirements of their culminating project and will require support. We can provide help through highly qualified experts that are fully experienced with the writing of culminating projects and fully understand the requirements for your authority and school. They can support you through every step of the process from selecting your initial topic area through to making your presentation. All support provided will result in unique and error free writing that will be proofread and also provided on time with a plagiarism report. So, if you are struggling with what is a culminating project – just contact our highly qualified specialists that can provide you with an expert help!